The Faculty of Humanities and its affiliated knowledge partners and institutions are housed at the Witte Singel Doelen (WSD) Complex. In the coming years the African Studies Centre and the Academy of Creative and Performing Arts, which are now located elsewhere, will move to the new Humanities Campus. The University wants to revamp its accommodation and create a lively campus. A campus with sustainable and transparent buildings that are connected by a new green outdoor space. A campus that connects. A campus where students and staff like to spend time. 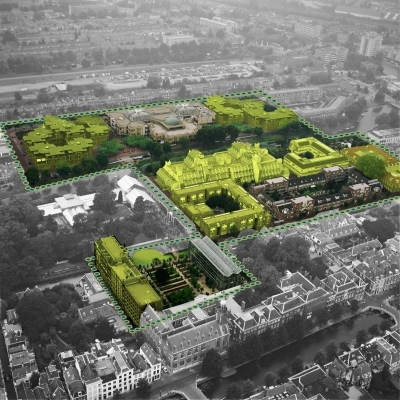 Want to know more about the past, present and future of the Witte Singel Doelen Complex? Visit the exhibition on the first floor of Lipsius, in the corridor by the IFZ and OSZ offices (by 1.31-1.38) or come on a guided tour. You will be able to ask any questions and find out more about the project and the deliberations that have been made until now. The exhibition is open during office hours. Send an e-mail to info@humanitiescampus.nl to register for the guided tour.